Y'all! I have some incredibly exciting news to share! I've been saving this for about a week now, but since it's the new year and all...I got a new computer, which means I can finally start blogging more and better. My old one was just crashing any time I tried to work on anything whether it be school or blogging. It was a mess, and I am so thankful to have a computer that works. Thank you to Mom and Dad for not letting me suffer through another semester without one. 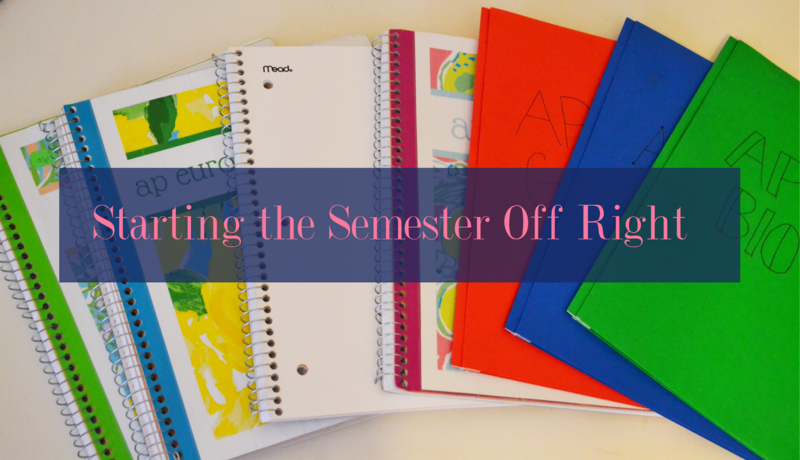 Speaking of new starts, today I am sharing my tips for starting a new semester on the right foot because I didn't really get to share any when school started. Start with a Clean Slate | This could mean everything and all things. For me, it meant starting a new section in my Euro notebook, buying a new notebook for government, and cleaning out all my binders. I have a three subject notebook for Euro, and amazingly enough I only used one section for first semester. #blessed Then I took economics last semester, so I needed to get a new notebook for my government class in hopes my notes will be better. Lastly, I clean out all of my binders and put my old notes in a file folder, so I have them for exams come May. This is something I did because I got a new computer, but if you're in college, it also makes sense to do. I created all new folders on my computer for my study guides and notes. Each class has its own folder to keep everything nice and organized. Replace Broken School Supplies | August is a time full of buying school supplies, but how much of it actually lasted throughout the first semester? For me, it's not a lot. The new year can be a fresh start for school supplies too. I got a new set of folders because my old ones got torn up during the semester, and I got a new pack of pens because why not? If It's Broke, FIX IT | If something didn't work last semester, change it. Insanity is doing the same thing over and over again and expecting different results. Change how you're organizing your agenda, your notes, or your binders. After one semester, you can get an idea of what didn't work for you and what did. Color Code System | I color code everything. This year each class I am taking has its own binder, notebook, and folder. For math, everything is purple. For bio, everything is green. You get the picture. 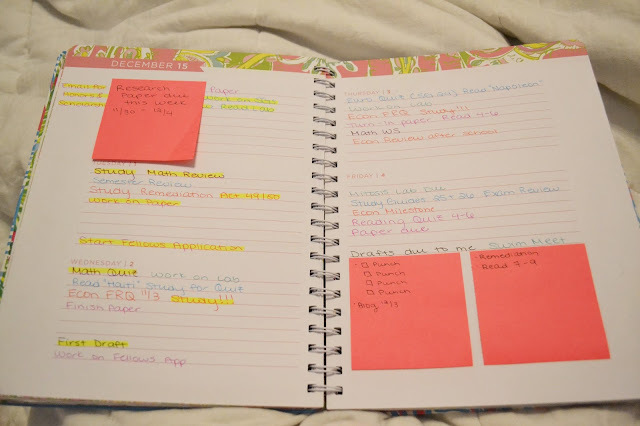 I translated that color code to my agenda. Ex. all my math homework/tests are written in purple. Bio is green. Euro is light blue. Econ/Gov is red. Lit is pink. I write all my newspaper deadlines down in black, and anything related to college is also written in pink but either in the margin or on the last two lines. Sticky Notes | Our Office Depot went out of business, so everything was on super sale, and my mom and I bought out the Post-It note supply. We have every single size from small to very, very big. I use sticky notes all over my agenda. I mainly write to-do lists and important reminders. 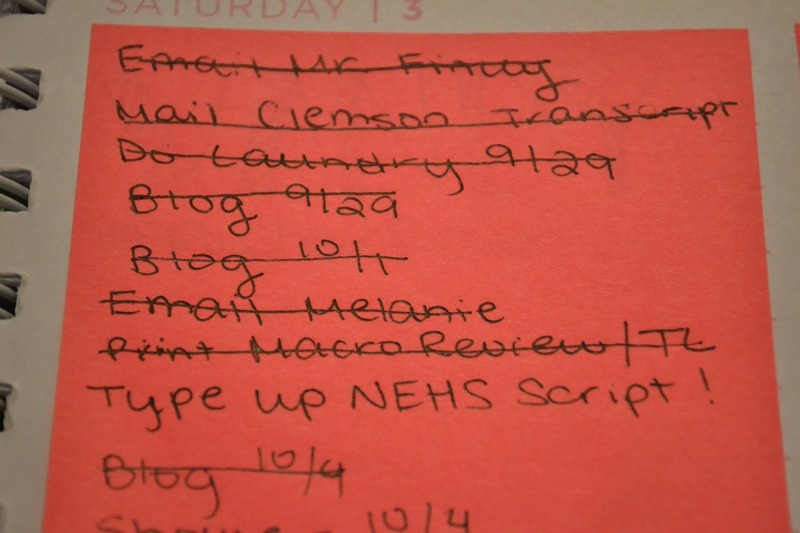 I keep track of blog posts, chores, and important emails. I like them because I can move them around and they add even more color. Creating Your Own Study Guide | I started doing this in late September/October. Before the test, I would take all my notes and highlight everything that I thought was super important. Then I typed up all the highlighted sections and reworded them. Then I printed those notes and wrote out reminders to myself and again highlighted the most important information. This really helped me, but I learned I needed to start doing this before the day before the test.